Jake Newman – S – Bellflower (CA) St. John Bosco: Newman is a 6’0″, 189 lb. prospect with offers from Colorado, Duke, Louisville, and Penn State. He visited Michigan this past weekend and earned an offer from Michigan on his trip to Ann Arbor. He’s a 247 Sports 3-star, the #65 safety, and #1043 overall. Kobe Pepe – DT – Bellflower (CA) St. John Bosco: Pepe is a 6’1″, 270 lb. prospect with offers from Arizona, Arizona State, and Penn State, among others. He’s a 3-star, the #47 strongside end, and #920 overall. Along with the other St. John Bosco prospects on this list, he was offered during his trip to Ann Arbor. James Smith – S – Bellflower (CA) St. John Bosco: Smith is a 6’1″, 175 lb. prospect with offers from Arizona State, Kentucky, and Oregon, among others. He’s a 247 Sports 3-star, the #77 cornerback, and #947 overall. 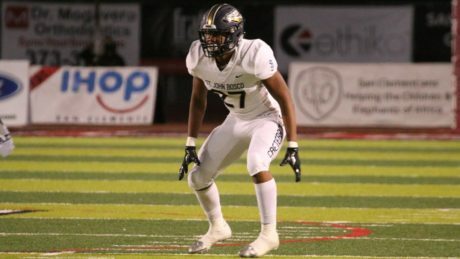 Kourt Williams – LB – Bellflower (CA) St. John Bosco: Williams is a 6’1″, 216-pounder with offers from Florida State, Georgia, Oklahoma, Oregon, UCLA, USC, and Washington, among others. He’s a 3-star, the #29 outside linebacker, and #381 overall. Here’s a list of visitors from this past week/weekend (LINK).